Since 1972 the Mauger’s have been producing fine quality meat from their own green grassy hills in the Southern Highlands of NSW. 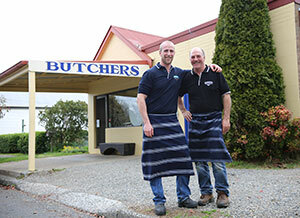 Through clever management of the land and selection of the finest stock, Mauger’s ensure their pasture raised beef and lamb have only the finest pasture in the Southern Highlands. Stock selection, quiet and passive temperament and stress free handling are important factors in producing fine quality meat. Mauger’s stock are carefully handled to ensure a stress free environment without the use of dogs or electric prodders that effect the quality of life for stock or the tenderness of the meat produced. Mauger’s livestock are also raised free from added hormones or antibiotics to ensure your safety and the highest possible quality product. Mauger’s Meats is a family tradition. 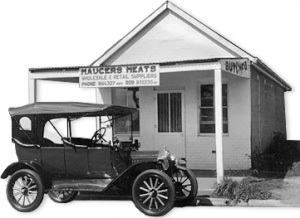 In 1972, Joe Mauger (John’s father), established the first butchery in Burrawang, principally selling beef and lamb. In 1976, at the age of 16, John started working at the shop and by 18 started managing the store while his father ran the farm. Today John prides himself on producing the very highest quality of meat by managing the process from the farm to the store working in partnership with his son Mat Mauger to produce a higher quality meat free from antibiotics or added hormones.